Gaithersburg, Maryland, USA – August 11, 2014 - GL Communications Inc., announced today the release of its enhanced Voice Quality Testing software with Wideband Bluetooth support using the next gen Dual UTA. “Latest technologies such as VoLTE and Advanced LTE are expanding rapidly with deployment throughout all markets and all carriers. The VoLTE supports HD voice over AMR-WB networks and requires sophisticated testing for both voice and data quality. Testing must include older generation narrowband networks along with wideband networks when VoLTE to VoLTE calls are established and maintained. Along with voice and data testing, the next generation networks also require delay and call retention testing. GL’s mobile test solution provides this capability with the flexibility of connecting to and between any network, any service, and any interface. He added, “The VQuad™ software is used for automated call control as well as to automatically send and record voice files from most any type of network (Wireless, VoIP, TDM, & Analog). It supports up to 8 telephony devices simultaneously. A minimum of two telephony nodes are required for transferring files, either within same VQuad™ Node or between multiple geographically separated VQuad™ Nodes. The VQuad™ along with the next generation Dual UTA, support for Wideband Bluetooth (as well as Narrowband Bluetooth) allows testing mobile devices supporting VoLTE networks (AMR Wideband). 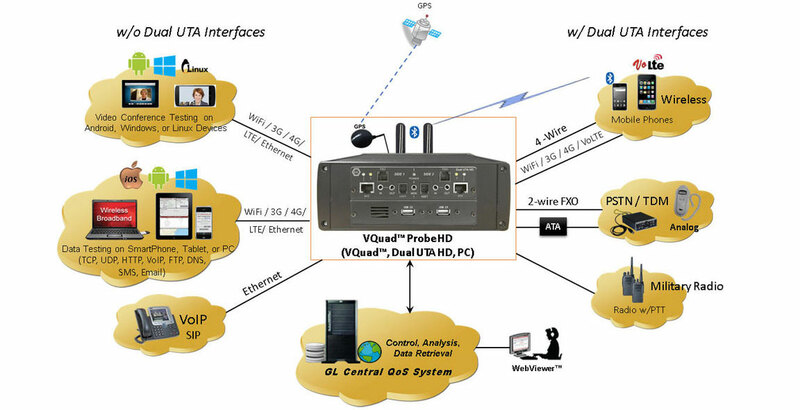 For redundancy and load sharing, VQuad™ supports connections to as many as four Central Systems. Full access to modifying these connections is available directly from the WebViewer™, Network Status. In addition to the VQuad™ multi-connection support, the File Monitor utility, which automatically transfers degraded voice files to the VQT system, also supports as many as four connections to the VQT system. Status and the ability to modify the connections is available directly from the WebViewer™, Network Status. Mr. Bichefsky further added, “GL's WebViewer™ is used to query and filter all results/events/errors from connected VQuad™ Probes. Current status of the entire deployment is displayed along with customized user statistics and results of the active tests. WebViewer™ now supports Network Status of all facets of VQuad™ deployment including VQuad™, File Monitor and VQT Applications, as well as all Mobile devices associated with VQuad™ NetTest (data testing). The network status also supports full remote operations. 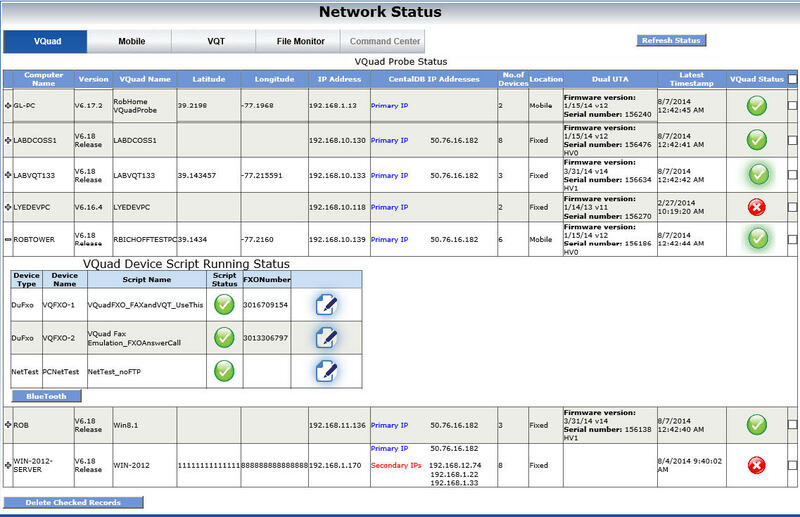 The following screenshot depicts network status information. WebViewer™ filtering process has been enhanced with parameters associated with NetTest along with Mobile information and GPS location. In other words, using the WebViewer™ one can filter the results based on a location or user-specified coordinates. He added, “GL’s Mobile Device Controller (MDC) provides a liaison to all supported Apple/Android based mobile devices for conducting data NetTests. The Data Tests can be remotely configured and automated from within any VQuad™ node irrespective of the mobile device proximity to the VQuad™ node.